Greetings from the frozen white tundra! For years, we’ve used Valentine’s Day as an excuse for a special homemade dinner. The menu varies from year to year, but it’s a nice tradition. Vanilla Butter-Braised Lobster, this week’s recipe for French Fridays with Dorie turned out to be the star of a perfect romantic meal. I live in New England which is “Lobster Country”, so finding a lobster without breaking the bank was not an issue. The plan was to spend the long weekend in Maine where the lobster would be even cheaper, but yet another snowstorm kept us off the road and safely nestled at home. Local lore tells that, once upon a time, lobsters were so plentiful that they were cheap and eaten mainly by the poor. In fact, I’ve heard one story where inmates in a prison revolted because they were so tired of a daily menu of lobster. 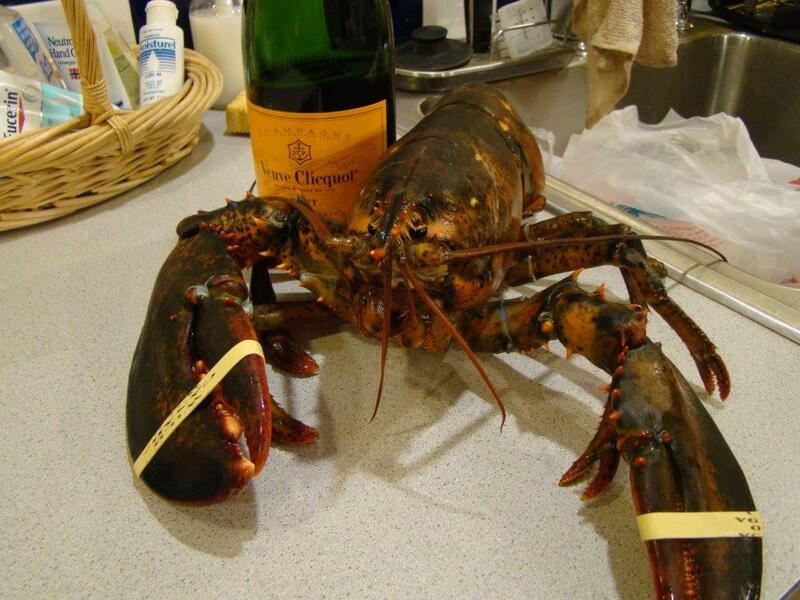 Lobsters have come a long way to become the luxury food it’s now considered to be. Because they are still caught locally, we enjoy lobsters all year long, especially summer weekends in Maine where we eat it at home on a picnic table on the porch. Lobster is so good steamed or boiled in its shell that I’m not sure I’ve ever had it as a fancier preparation. Sure, we’ll cook an extra one or two to make next-day lobster salad with the meat. 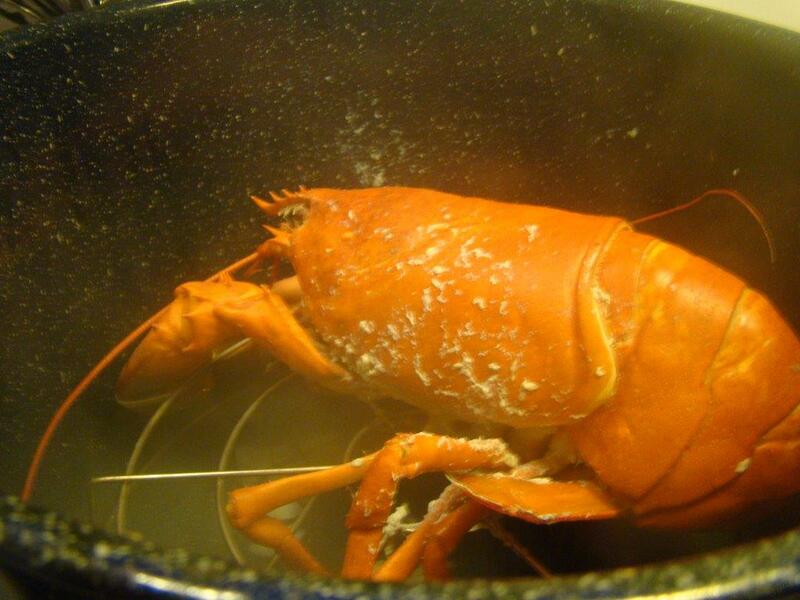 Or I’ll often save the shells and bodies to make a simple lobster bisque (more on that this weekend). Beyond that, steamed lobster is my favorite way to go. It’s so rich, we don’t even bother dipping it in melted butter. 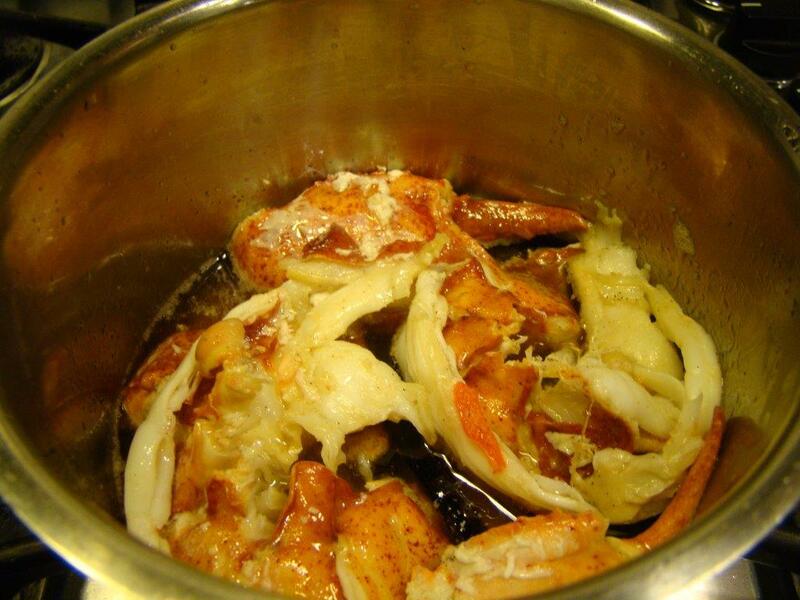 The French Friday recipe, though very simple to prepare, was much more elegant than our usual “lobster in the rough”. First, you clarify some butter. 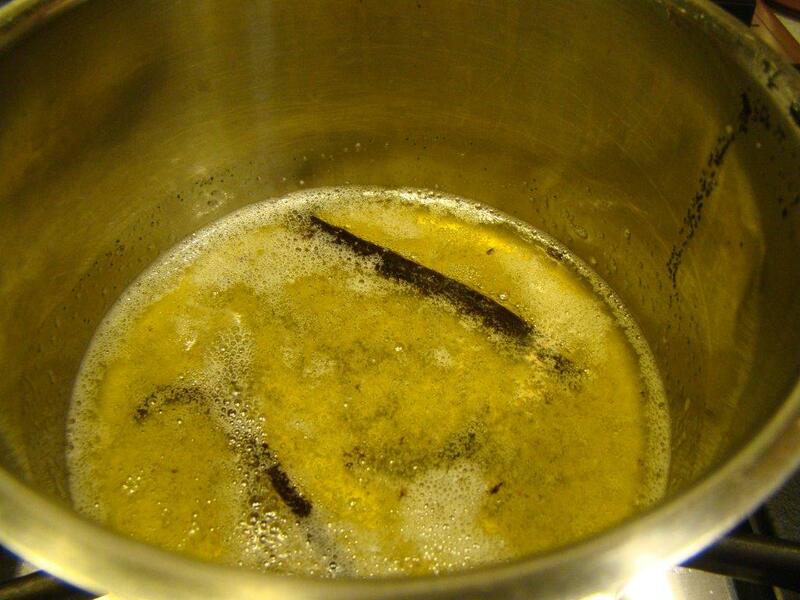 Once clarified, the pulp and pod of a vanilla bean infuses in the butter while the lobster is cooking. Finally, after shelling the lobster to extract the claws and tail, the lobster meat finishes cooking in the vanilla butter bath. The lobster is plated (without all the butter) and sprinkled with fleur de sel and fresh pepper. Simple yet fancy at the same time. I made a few minor adjustments, but all in the same spirit of the recipe. First, it turns out that lobster must be popular Valentine’s Day fare because when I went to the grocery store on Saturday morning, all the smaller lobsters were sold out. The fish guy had a 3½ pounder, which was big enough to share, so I brought her home instead. At $8 a pound, it was still a good deal. Because of the size of the lobster, we changed up the cooking method a bit. Instead of partially cooking it then ripping it apart, we just steamed it whole for 25 minutes, until it was nearly cooked, then took out the claw, knuckle and tail meal. Also, the recipe calls for a pound and a half of butter. We were making about the half the lobster, but even so, I used only 1½ sticks which was plenty to cover all the meat and impart its vanilla flavor. I saved the leftover vanilla butter, and I’m thinking of bathing some cooked shrimp in it to serve over rice for dinner tonight. To round out the Valentine’s Day meal, we started with a bottle of Veuve Cliquot, served the lobster with potato rösti, and finished with molten chocolate cakes. As the snow fell outside, staying nestled inside our (not so) warm house was just the thing for the evening. To see how the other Doristas enjoyed their lobster, check out their links here. You can find the recipe in Dorie Greenspan’s book Around My French Table. Posted on 20 February 2015, in French Fridays with Dorie, Snowstorms and tagged French Fridays with Dorie, lobster, romance, valentine's day. Bookmark the permalink. 16 Comments. The price of lobster was really low this summer but it went back up in NY. I love your original idea to go to Maine, but this weather has been extreme. I have heard the poor man’s lobster stories too… it seems amazing that it was ever true. Oysters were street food in NYC… My daughter reminded me that lobsters are related to cockroaches anatomically… teens make such lovely dinner conversation. Glad you had a nice meal. I want to eat lobster on a picnic table in Maine with you! Your Valentine’s dinner sounds amazing!!! Your Valentines feast sounds amazing! Molten chocolate cakes – oh my. I thought the butter component was rather lavish too. Hang in there for the spring – it’s almost there. What a delightful Valentine’s Day! Your dinner sounds amazing…Your talk of Maine reminded me of the time Paul and I went up to Bar Harbor. It was a great trip, but the part I remember the most clearly is Paul making us share a–very small–lobster at one of those side-of-the-road lobster shacks. I was not happy! It was about as cheap as you’ll ever find lobster, and he still thought it was too expensive for us each to get one. too fond of the flavored butter, but glad I tried it. I was already thinking about you guys and the Maine connection when I first saw this recipe. Funny that Dorie manages to find a way to tweak (hello vanilla…..) even the ingredients that we are known locally for ! Your dinner sounds absolutely fabulous and the Veuve was an expert touch :) Stay warm – spring and lobster rolls will be here before you know it ! Hi Betsy, Hope you are keeping warm in that tundra but it seems you are managing, nevertheless, with such a lovely Valentine’s meal. Like you, I rarely prepare lobster outside its classic versions, but unlike you, it is still quite pricey in Philadelphia so one needs to work around the few occasions of the big sales where one, in some cases, even needs to order in advance. Much as I enjoy it, I could not eat it everyday, and so, understand the plight of those forced to do so in past history. This dish looks interesting, definitely unique, hope you enjoyed it with your shrimp if this idea transpired too. We are in the midst of snow, and deep freeze, but not like our further fellow East coasters. Wishing you well, and spring will soon be on its way! Betsy, sounds like you enjoyed an absolutely delicious Valentine´s meal despite the white tundra-like weather conditions! I must admit to being very, very jealous of the lobster – no way to have so much lovely, delicious lobster aviablae in such abundance in these parts – although I must admit that this dish even worked with fresh prawns – it was just all about few but really good quality ingredients! So sorry your Maine adventure was ruined but glad that you were home, safe and sound. Your lobster background is PhD-level knowledge. Mine is 2nd or 3rd grade. Although I have been in Maine and had lobster rolls every chance I got, I just had always thought of lobster as a luxury food. Am anxious for you to blog about lobster bisque. Susan and John made it also. I am looking forward to making potato rösti this week if I can finish up my chosen recipes for CCC. I know the snow has been relentless and I am not so sure you will be getting any relief this week. Then, it had to melt. That’s always trouble also. I know this is hard. Stay safe. Put on an extra sweater (or, parka) when you get cold inside the house. Been there and done that!!! Sounds like you had a wonderful Valentine’s meal. I am impressed with your lobster cooking skills. We also paired with a potato dish and chocolate is a requirement for dessert. I will have to check out your recipe for those cakes. I did have a wonderful time with the Doristas. I hear you have relatives in California. Let me know when you are in the state, my door is always open. Looks great! I loved that this recipe was elegant, yet simple, allowing the lobster to shine through. Sounds like a wonderful meal! Waving at you from the other side of the frozen tundra. (-18 this morning – gah!) As pretty as the snow is, I am ready for some sunshine and warmer temperatures. This was perfect for an evening in, wasn’t it? Your meal sounds delicious. Sounds like a delicious meal! 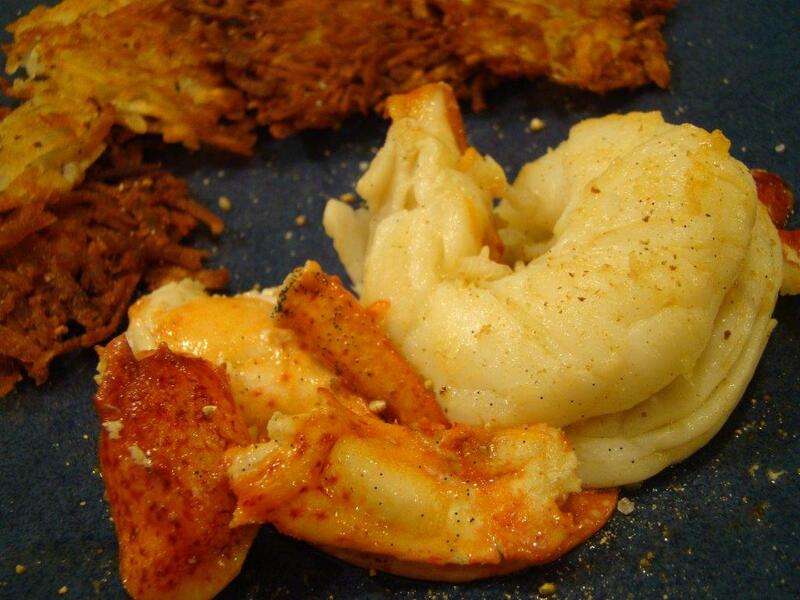 I too have long been a purist when it comes to lobster, thought I do admit to also loving a really good lobster role. But Dorie’s version was delicious and elegant and I would consider doing it again. Hope you get a respite from the snow soon.